I am teaching a 2 week series on Trying to Figure God Out, and the one curvy phrase I am attempting to straighten out is; Everything Happens for a Reason. This ever-so-popular phrase is what many people say in hindsight to some tragic or ill suffered event that has occurred and has somewhat work out in their favor … or at least has worked out. Now, the reality is that YES everything does indeed happen for a reason; this is called cause and effect. But when people say it that is not usually what they mean. What they mean is that “God made me get in a car crash so that I would meet so-n-so in the hospital and marry him”. No, actually you got in a car crash because you were texting while you were driving therefore you did not see the car in front of you come to a sudden stop, and just so happens that someone that you were compatible with was there also because he was texting and driving… this is why you make a good couple. Lol! Or “God sent me to prison to straighten my life out”. No, you went to prison because you knocked off a Quick Trip, but while in prison reality struck you in the face and you now realize that stealing is bad (Bible talks about this) and will cause much grief. I am a little tongue in cheek … but I think you get the point. God is not in heaven causing people to break their legs, get into car crashes, or lose their jobs. This is what we call life! Life happens, to all of us. Though I will say that I have noticed that many of the “not so positive” stuff that happens in our life is a result of something stupid we’ve done, and in God’s love and wisdom He USES those times to teach us … and hopefully we learn! 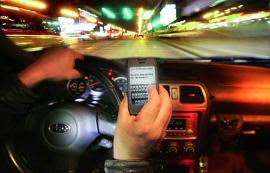 Save Lives - Don’t Text and Drive!